There are endless things to do with mackerel but this is one of my favourites. 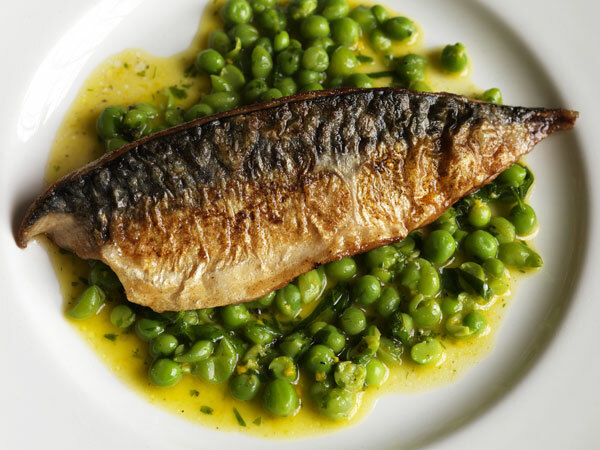 It’s a nice clean summery dish and you can prepare it with mackerel fillets or just cook them whole. If the mackerel are small, then use two fillets per person, or alternatively you could ask your fishmonger to butterfly them. Heat half the butter in a pan and gently cook the shallots for a couple of minutes until soft, add the orange zest and juice, fish stock and peas, season and simmer for 2-3 minutes, then stir in the rest of the butter until emulsified and remove from the heat. Heat the rapeseed oil in a heavy or non-stick frying pan. Lightly flour the mackerel on the skin side and season. Fry the fillets skin-side down, first for 2-3 minutes until the skin is crisp, then turn them and cook for a couple of minutes on the other side. Spoon the peas on to serving plates; lay the fillets on top. This entry was posted on May 7, 2011 at 2:59 am and is filed under Food with tags butter, fish, fish stock, fishmonger, flour, freshly ground black pepper, frying pan, juice, mackerel, olive oil, orange, peas, rapeseed oil, recipe, salt, shallots, zest. You can follow any responses to this entry through the RSS 2.0 feed. You can leave a response, or trackback from your own site.